Posted August 18, 2015 by admin & filed under White Bear Lake Auto Repair. Every time you bring your vehicle into AM-PM Automotive Repair, our certified technicians perform a thorough inspection of the key components of your vehicle. But rather than wait for your next visit, you can help catch warning signs early and prevent further damage by performing a quick visual check of your vehicle at home. Walk around the car and do a quick check over the exterior. Check that your lights are working – you can’t see if a taillight is out while driving, so get out to check periodically. You can also pull up to your closed garage door and look for the reflection of both headlights (and turn signals) on the door. 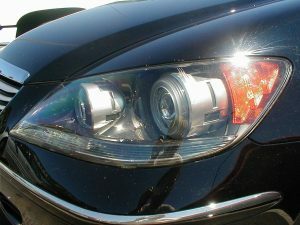 Headlights are important so you can see while driving, and so other drivers can see you! While you’re looking at the exterior, check for dents, scratches, or other damage that might lead to rust or other problems. Dirt and contaminants on the road can collect under the car. If you notice large amounts of buildup, it’s time for a carwash – not only to remove the dirt, but to prevent damage and protect your investment. Look under the hood for anything out of the ordinary, like pooling fluids, corrosion, dirt or grime. If you do this regularly, it will be easier to identify changes under the hood. The next time you visit our shop, ask our advisors to teach you about the key systems in your vehicle. We’ll take the time to pop your hood and point out the major items so you know what to look for when you check at home. Our full inspection takes a much deeper look at the condition of your vehicle – these at-home inspections are a great way to keep an eye out for warning signs in your vehicle, but don’t neglect your routine maintenance. The trained and experienced eyes of the technicians are able to catch things you might miss and help you understand the best options to care for your vehicle. Schedule your next appointment online or call us at 651-426-0462.